Canon has been working in India with a simultaneous and consistent focus on social development and environmental protection as not just a corporate social responsibility but also as a mandate. Canon India’s view of CSR extends beyond charity and focuses on means to create self-sustaining communities that can be nurtured for a long period of time. On World Environment Day 2017, Delhi Greens catches up with Mr. Kazutada Kobayashi, President & CEO of Canon India, in an attempt to understand the motivation behind Canon India’s dedicated commitment towards society and environment, Canon’s Kyosei philosophy and existing and future action plans. Delhi Greens: Canon India has taken considerable steps towards environmental protection and preservation. Can you list some prominent green steps taken by Canon India that you are proud of? Earth Hour at Canon India: At Canon India, we have been supporting Earth Hour for the last seven years in a row. By switching off lights across all our offices, we not only commit towards realization of a sustainable society but also influence employees and associates towards environment conservation. Canon Kids supported CIPL in its Earth Hour initiatives: Our Quality Environment Health & Safety (QEHS) team invited children of employees to experience the usage of renewable energy at Canon India. 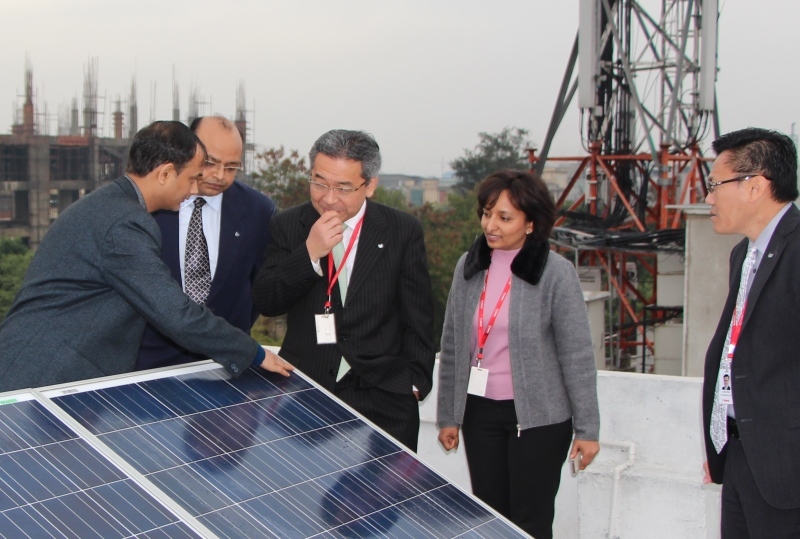 Children were invited to visit the Solar Panel installed on the rooftop of Noida office. This activity included a presentation on Earth Hour along with educating the children on the benefits of using renewable energy. Celebrating Environment Day with the Community: At Canon India, we take pride in our commitment to the community, we have adopted four villages across the country along with an association with SOS Villages of India. Our employees recently celebrated the upcoming World Environment Day with the children in SOS Greenfields Village, Faridabad along with a Photography Workshop. This engagement by our employees under the aegis of Canon Involve resulted in a learning experience for this children, covering the aspect of both the environment conservation and photography. Delhi Greens: Climate change is one of the most concerning environmental challenge being faced by the world today. Tackling climate change requires both awareness and on the ground action. Can you please share some ways through which Canon India is ensuring the spreading of awareness on this issue in the staff and employees of Canon India? Mr. Kazutada Kobayashi: Recognizing the importance that biodiversity plays for a sustainable society, and following our corporate philosophy of Kyosei, signifying living and working together for the common good, Canonites understand their responsibility towards the environment. Delhi Greens: The theme of World Environment Day 2017 is Connecting People to Nature. Canon India has been doing an excellent job by providing state of the art cameras to Nature and Wildlife lovers. Are there any other initiatives that Canon India has taken or plans to take to raise environmental awareness among the masses? Mr. Kazutada Kobayashi: Canon fully recognizes environment as an important basis for a sustainable society, and promotes activities that contribute to biodiversity and environment conservation. This World Environment Day, we are organising a workshop called 260 degree Documentary Workflow. In association with the Green Oscar winning documentary filmmakers Vijey Bedi and Ajay Bedi, Canon will shed light on the appropriate and latest technology for documentary film making and spread awareness on how organisations can grow while being committed to saving and protecting the environment and biodiversity. Delhi Greens: What is Canon India’s contribution for raising awareness on the issue of eWaste in its staff and customers base? In line with the e-Waste Rules, we ensure that an effective collect back mechanism for e-Waste is in place. Information about this collect back mechanism is provided to the customers through the corporate website. A separate queue is available on the Call Center IVR for taking requests for e-Waste collection and handling enquiries on e-Waste. Information is also shared with the customers by way of information sheet inserts in the product packaging, product catalogues, etc. Delhi Greens: Canon is known the world over for its Kyosei Philosophy, which aims at ensuring a sustainable today and tomorrow. Please share with us some recent initiatives taken in this direction by Canon India. Mr. Kazutada Kobayashi: Our organisation is constructed on the principles of sustainable economic development. Hence, we at Canon India, take responsibility for the impact of our activities and their effect on the natural environment, in line with our corporate philosophy of Kyosei. Beyond our company activities, Kyosei influences the way we operate within the wider community and with organizations throughout the world. We believe that being a good corporate citizen is of paramount importance and are mindful of how our activities impact on our customers, employees, partners and the world around us. We have a dedicated Quality Environment Health & Safety (QEHS) team that keeps working on environment initiatives throughout the year. Every year, we closely monitor the progress of our initiatives throughout the product life-cycle, making steady strides toward energy conservation, resource conservation, elimination of hazardous substances, and biodiversity conservation. Delhi Greens: What message would you like to share with our readers as well with other corporate houses on this World Environment Day? Mr. Kazutada Kobayashi: At Canon, while ideating products, one of the most important elements that is taken care of is energy conservation. All our devices are so designed as to consume minimal energy when in use; many have been programmed to go into auto-cut or auto-stop when not in use. As for the printing devices, apart from energy management, they are embedded with smart technology that can help users keep a count of the paper printed or to put a tab on the number of prints. The printed literature that is shared with devices also propagates environment conservation. We advise users to be conscious and conserve power and natural resources. This is the practice that we follow globally. Achieving and maintaining the perfect balance between profit making, protection of environment and sustainable development becomes imperative for organisations as well as individuals to ensure a safe environment for generations to come. Thus the adoption of environmental friendly technologies and practices — with the aim of reducing carbon footprint and protecting the environment is a worthwhile choice to consider.